Because of last week’s holiday causing a lack of new shows and my general attempt to drink through most of the week there was no article. I will talk about the shows from the week before, because I feel like I should start doing this article again and that this is a dead time to fill with TV talk. 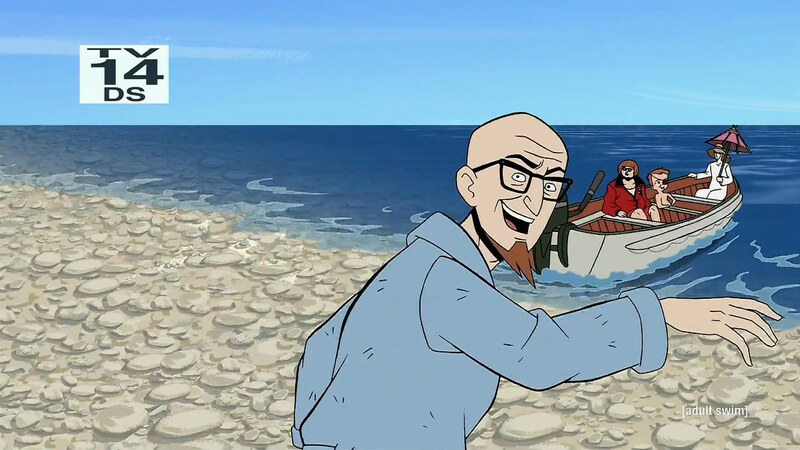 Sometimes years go by without an episode of The Venture Brothers seeing the light of day, those are dark times for man. 2013, despite what the Mayans seemed to have thought, has proven to be a good time for everyone due to the return of the series. The main theme of the show is failure, and in many ways it is hard to argue. I love the flash backs to Rusty’s (James Urbaniak) old days as a child when everything was supposed to be perfect and work out to be wonderfully for an older him, only to end up being pretty much the same only more dilapidated and less adventure heavy. It is almost like the show wants to always remind us that it isn’t just us that failed, the world failed us as well—which is good because I do like blaming others. Speaking of the aforementioned younger Rusty, this episode took place on a Greek island where he was once treated to Spanakopita—not the pie food thing but instead a local festival that serves to both rob tourists of their money and distract young people from the fact that they were accidentally kidnapped. Considering that the finer points of describing a Venture Brothers plot is more like talking about a fever dream than it is writing something up I will forgo pretty much the rest here. For serious though, go out of your way and watch this entire series up until this point. It is amazing. This is the last season of a cult classic. That announcement was made about a month before this season started airing, they promoted this season as such. They did everything besides directly saying that every stop would be pulled out, thrown away, forgotten about, and higher scores of people for some of the best script writing that mankind has ever seen. This should have made, “Into the Wild Green Yonder” look like a pile of vomit that vomits Kardashians. If there was ever a season that you make people regret a show ending it the one that is announced months before hand that it is over, the one that you take all of the scripts that you never used for various reasons that make better and put on the air. So far this seasons high points have been math jokes. Lrrr (Maurice LaMarche) takes his child on a trip to take over Earth to earn a merit badge, because I guess that is a thing that happens in 1000 years. This, of course results in the TV being cut off from the planet and Fry (Billy West) being stranded there. 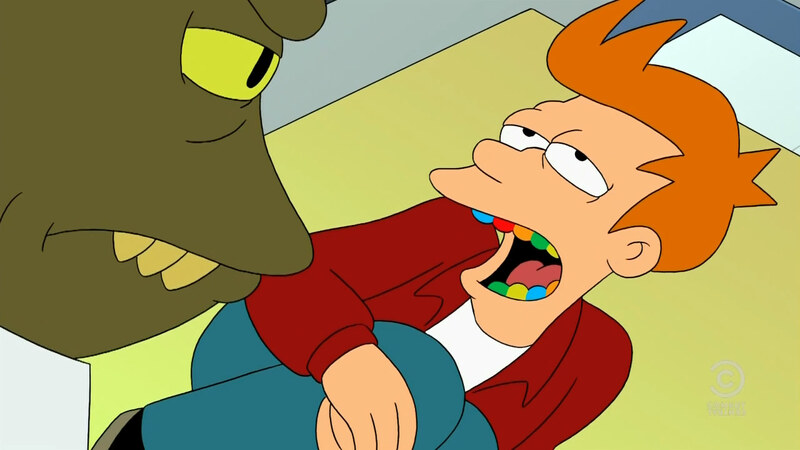 I could sum this entire episode up perfectly when I say that the best joke involves Fry being unable to stop eating rainbow colored poop; because it isn’t a Mad Lib quality episode of this show without Fry being unable to stop eating something disgusting. It isn’t even like I am angry at Futurama, I am just really all kinds of disappointed. There really aren’t that many good science fiction television shows out there anymore. Sure, you could come up with a list as long as my arm of shows that certain terribly named channels will try and run from time to time—some with even a mild degree of success. The problem is that most of those shows end up not being that wonderful, were only ever thought of as a mini-series, or were put together by less than experienced show runners that simply don’t know how to hold the connective tissue together. 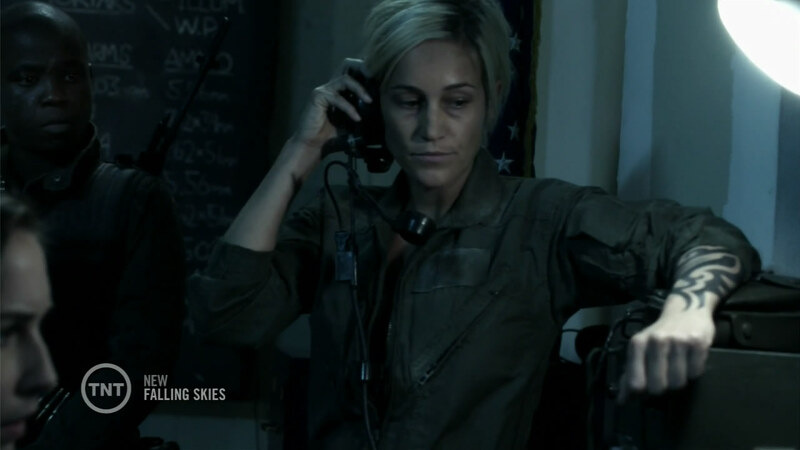 Falling Skies has thus far managed to avoid all of these pit falls, even if there are random pacing issues towards the middle of most seasons. You know when a new season of a very plot driven show starts and you feel like you missed a couple huge pivotal points of information; that is basically what is happening this season. There is rumors going around about a mole inside of the human resistance fighters, and it is looking more and more like it is Hal (Drew Roy) being controlled by the alien invaders. My problem with that is that he is sort of aware that this kind of thing might happen, with most other people, so instead of turning himself in and dealing with it in a timely and effective manner he decides to just let it go to such a point that he clearly loses control over it. That is like someone being too busy eating ice cream to get a heart transplant due to excessive ice cream eating. Burn Notice is the story of James Bond having all of his special toys taken away and being forced to out MacGyver MacGyver. The show is on basic cable so Michael Weston (Jeffrey Donovan) has a problem killing people and a heart plated in some kind of magical spy gold; it also has been running for seven years and is very quickly starting to run out of ideas of what to do to push things forward regarding plot. The show is called Burn Notice but I am pretty sure that the cast of characters has already gone through the process of either killing for destroying every organization responsible, as well as the businesses backing them, for Michael’s burning, and several other secret-er spy type networks backing everything to begin with. It has gotten to the point that I really don’t have any idea why anyone is mad at anyone anymore aside from I guess everyone being an active spy again, so… kind of nothing has happened. This season started with Michael going in for a “deep cover” operation and has proceeded to be the slowest and possibly least interesting series of four episodes I have seen since the show started. I get that the entire theory for this arch is to take the crew and place them out of their comfort zone while working with people who make that discomfort look like they were getting a Hand Jibber from super models at the beach. That was a great idea, for two episode that wrapped up quickly at the start of the third. This is now approaching a fifth with both no end in sight and a promise of even more to be boringly revealed at a leisurely pace that seems like this could have been a special “movie” episode instead of an entire last season. If it wasn’t for Bruce Campbell (playing Sam Axe) I don’t even know why I would be watching, aside from the fact that I have this thing in my head that tells me I need to finish TV series. 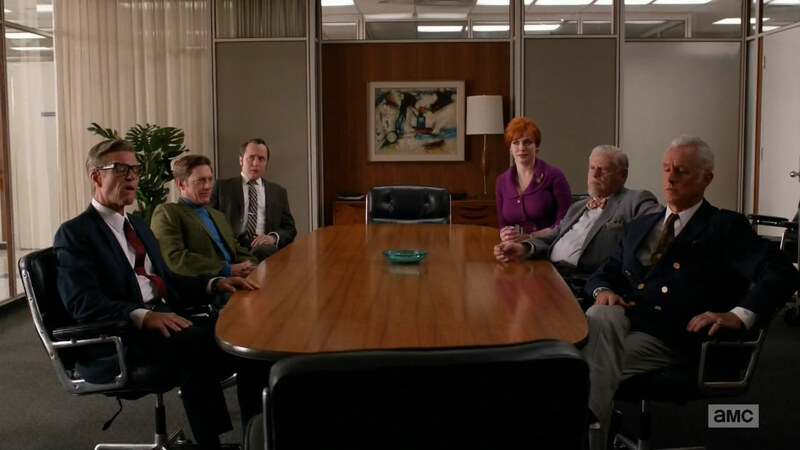 I was thinking about doing an article on this season Mad Men, and truth be told I still might. I think that as a whole it might have been one of the most well-constructed examples of writing that has hit the small screen in a really long time. I don’t know if I can really stress enough just how wonderful it feels to come home from work and go into a fictional land where every single person is as completely and utterly screwed up as a real human, and I can forget about all the failures of life and just judge other people for being completely terrible while I don’t blame myself because I am totally not cheating on my wife at all. The season has kind of been leading to this road of destruction as Don (Jon Hamm) has taken his agency down a road of success but pretty much driven his personal life into a ditch, lit it on fire, then walked away in slow motion while continuing to have affairs with other people’s wives. Honestly, if half the stuff he did wasn’t so completely slimy and terribly I would want to start a slow clap for him getting away with it for so long. The season pretty much ended with Don’s very public, very messed up, very terrible and awful break down in front of a rather huge client. The only complaint about this episode that could really be leveled against it is that the show has been running for six years and I am pretty sure that people were just expecting this to happen roughly eight years ago. Every single sane person in the world has a ghost story. Half of them are things that could probably have been easily explained if the person hadn’t been scared to death, half asleep, or both at the time of the event. Of the remaining half most of them aren’t worth telling. That leaves you with a handful of tales that are legitimately spooky when told correctly. Most of those happened in the first season. At this point the show has just started taking the spooky stories and hoping that people can’t read between the lines too much. One episode this season a woman claimed that the devil appeared in front of her. Not a devil, The Devil. That is a lie. This show also doesn’t have very good special effects. It was hysterical. This week’s episode quickly fell from “that is kind of weird and spooky,” to “that just didn’t happen”, basically meaning that while it was one of the better episodes it was still the worst episode of the week. It was about a haunted restaurant with scores of employees, most of whom did not natively speak English. Now I am not saying that the people from Mexico lied about the sightings or anything, but the owners of the establishment seemed to have much more believable sightings and “oddities” than the Spanish speakers who claimed to have a poltergeist repeatedly try to kill them. I am not saying that the staff members made that stuff up, but since I don’t understand a word that the people they are interviewing are saying and the resolution of the problem came down to using a “local psychic” I am going to learn more towards attempt at odd local ghost attraction and the producers lying.